I've been having trouble lately finding new cheap investment ideas without a lot of hair on them. So I've spent some time re-reading classic investment books and seeing what I can glean from a 2nd or 3rd reading. A common investment theme of Peter Lynch, David Einhorn, and Seth Klarman has been investing in mutual bank conversions, something I've looked at in the past, but generally passed on for no particular reason. But at this point in the business cycle, I'm attracted to the built in value and clean balance sheets of mutual banks that convert to stock corporations. This isn't a new strategy, but I think for the individual investor, its an easy formula to follow for above average returns with relatively low risk. Mutual banks are those that are "owned" by their depositors and have no shareholders, they're designed to be low risk institutions that cater to their members by taking deposits and making loans in the community. They tend to be conservative in their lending and accounting as there is no stock or ownership group to please, and reporting profits could be a sign of risky lending. When a mutual bank determines it wants to convert to a stock corporation, the depositors have to come up with cash in order to buy shares in a company they already "own". Unlike a typical IPO, there's no exiting investor group selling their shares to an unsuspecting public, its the bank's directors and the IPO buyers on the same side of the table. By construction, the post-IPO thrift conversion is undervalued. By adding the new IPO share proceeds to the existing equity capital held by the bank, the new investors effectively get the company for free as ownership of the post-IPO bank includes both the offering proceeds (minus expenses) and the exisiting capital itself. What you end up with is a low-risk balance sheet with excess capital available to increasing assets at a significant discount to tangible book value. In many cases, mediocre banks begin to show profit improvements after the IPO as the animal spirits of the thrift's management takes over. Newly converted mutual banks tend to outperform due to these reasons, however they are restricted from repurchasing their stock for 1 year post IPO and from being acquired for 3 years post IPO. After this three year lock up period, many converted thrifts are purchased at premiums to their tangible book value. On July 15th, Sunnyside Bancorp (OTC: SNNY) completed their mutual conversion IPO by selling 793,500 shares (adjusted maximum) for $10 a piece. Sunnyside Bancorp is the holding company for Sunnyside Federal Savings and Loan Association of Irvington, a one branch thrift located in Irvington, NY, a bedroom community about 25 miles north of New York City in Westchester County. Irvington is a small affluent village on the Hudson River. It's been named as the "Best Place to Live in Westchester" which is the second wealthiest county in New York, with a median household income of $80,725 and a median home value of $547,000. Besides being located in an attractive community, Sunnyside's balance sheet shows a conservatively run thrift that's ripe for additional capital to improve profitability. Sunnyside is primarily funded through customer deposits and has no senior debt. A vast majority of their loans, 86.4%, are owner occupied residential mortgages which ranked high on Peter Lynch's criteria when investing in small thrift banks. The view on the safety of residential mortgages has probably changed drastically from the early 1990s (when Peter Lynch was investing in mutual conversions), but Sunnydale's portfolio is rather clean, they have no subprime or Alt-A loans and borrowers almost always need a 20% downpayment. Historically, Sunnydale hasn't written their mortgages to "conforming" standards since they've held all their mortgages on balance sheet, but going forward they will be putting more emphasis on selling mortgages to the GSEs in order to increase non-interest income, a general theme of their strategy going forward to increase profitability. Unlike many large banks, Sunnyside's balance sheet is basically free of problem assets, as of the S-1, they had zero delinquent loans. It looks like that's changed slightly as of the latest quarterly as 1 loan has slipped into delinquent status, but overall Sunnyside's balance sheet is almost a blank canvas. Although the balance sheet is clean, Sunnyside posted a net loss in 2012, but with the excess capital, what could Sunnyside's income statement look like post-IPO? 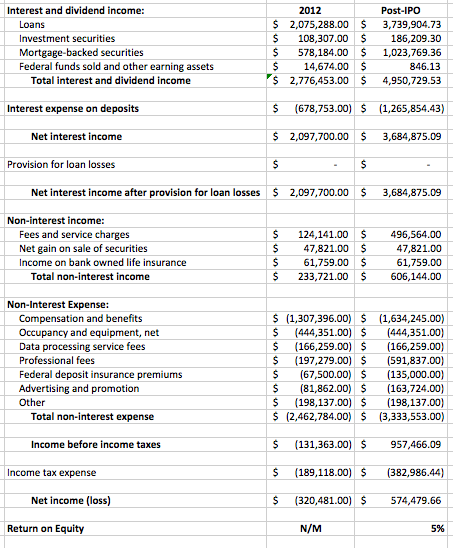 Below I attempted to make a pro-forma income statement using Sunnyside's current net interest margin (which hopefully will increase as Sunnyside makes slightly riskier loans), increasing the thrifts non-interest income to represent the new strategy to sell loans to the GSEs and then increasing expenses as appropriate for the increased size and newly public status. While a 5% ROE is still too low, it should be a fairly conservative proforma estimate. I would expect Sunnyside to improve on these results as it engages in slightly riskier lending and the stock ownership/options of management increases their incentives to generate a profit where that wasn't a key motivation as a mutual bank. And despite a potentially low ROE, Sunnyside's value should still be close to tangible book value as an acquirer (after the 3 period is up) can come in and buy the company, strip out the costs, and utilize any excess capital to their advantage, the equity capital is worth more than the bank as an ongoing entity. Slight tangent: In December 2012, Sunnyside was approved as an SBA lender and plans to hire an SBA loan officer here shortly. SBA 7(a) loans are typically for small businesses that cannot get credit at reasonable terms elsewhere, so these are risky loans made to less than credit worthy borrowers. To encourage small business lending, the SBA will guarantee up to 85% of the loan balance if the loan meets certain criteria which can often lead to a lengthy paper intensive underwriting process. On the positive side, the guaranteed portion of SBA loans are in high demand (and sell at huge premiums) because they have no default risk due to the U.S. government guarantee, and their interest rates are typically higher than comparable treasuries as they are floating off of prime. Many banks will sell their SBA loans to regional investment banks who specialize in pooling these loans into securities. The original lender will keep the unguaranteed portion of the loan, and will continue to service the loan and collect a servicing fee. By selling the guaranteed portion, a bank like Sunnyside can effectively increase their profit margins on each loan because they maintain the servicer fee on the entire balance, while only keeping the unguaranteed portion on their books (and the credit risk), plus they pocket much of the premium at the initial sale of the guaranteed portion. Sunnyside currently has little in non-interest income, so the move into SBA lending will likely be a nice source of additional profits for the small thrift. In 2008, Sunnyside brought in Timothy Sullivan as President and CEO, his previous experience is mostly as a commercial lending guy which explains the gradual move toward commercial lending that Sunnyside plans to make. Being such a small thrift, it's hard to get much information on Mr. Sullivan, but given Sunnyside's lack of delinquent loans and relatively strong balance sheet, it would appear that he's taking a moderate approach to the move into riskier commercial lending. Directors and senior officers are buying $440,000 of the offering, not a small amount for a bank with only 15 full time employees. Additionally, there will be an ESOP which will dilute shares, but is a net benefit as it will align their incentives with the outside shareholders and in this case, the performance of each employee can really make a difference. Sunnyside is a very small bank and pre-IPO it wasn't particularly overcapitalized like many pre-conversion thrifts. Post conversion, they're going to need to increase their asset base by 75-100% to generate an acceptable ROE, given tepid loan demand and fierce competition for good loans, Sunnyside might not be able to lend that money out at favorable risk adjusted rates. My plan going forward is to dedicate a portion of my portfolio to purchasing new mutual conversions soon after the IPO date if I can buy the newly converted thrift for less than 2/3rds of tangible book value. I will then look to sell once the thrift reaches tangible book value and recycle that cash back into new mutual conversions. I'll leave myself a little room to change course if the 3 year acquisition period is around the corner, but my general goal is to be methodical with this strategy long term. Tropicana Entertainment is the majority owned gambling unit of Icahn Enterprises that trades over the counter under the symbol TPCA. The quick summary thesis is as follows: (1) Tropicana has a large net cash position, (2) Carl Icahn owns 68% of the company and has a strong track record in the gaming industry, (3) A small float and an OTC listing creates an opportunity for individual investors as its equity is ignored and illiquid, (4) the regional casino industry was over built in the 2000s and is generally unloved by investors. On Friday, Tropicana used the majority of their net cash position and available liquidity to purchase the Lumiere Place casino and attached hotels/restaurants in downtown St. Louis from Pinnacle Entertainment for $260 million. As part of the Pinnacle's purchase of Ameristar (for over 8x EBITDA), Pinnacle came to an agreement with the FTC to sell one of the combined Pinnacle/Ameristar's three casino properties in St. Louis that controlled 60% of the market share which was a concern for regulators. Opened in the beginning of 2008 at the height of the casino building bubble, Lumiere Place is an upscale casino located across from the Edward Jones Dome and America's Center convention center near the Gateway Arch. 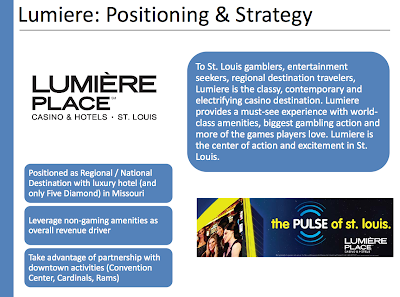 In addition to the 2000 slot machines and 68 table games, the Lumiere Place property includes two hotel properties in the Four Seasons Hotel St. Louis and the HoteLumiere, plus additional restaurant and retail space. 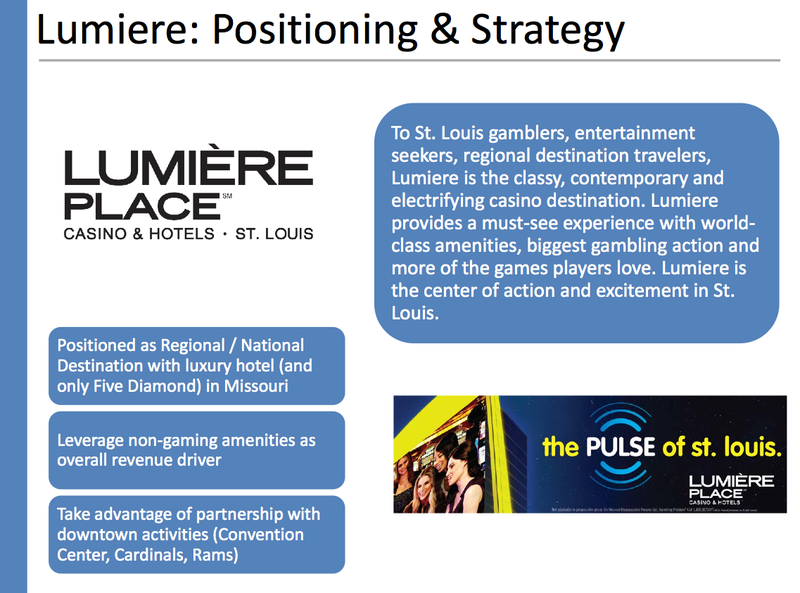 Pinnacle has positioned Lumiere Place as a luxury brand that is less focused on the slot/retail gambler and more focused on table games and non-gambling related revenue which is a departure from Tropicana's current core consumer (I believe should be seen as a positive). In total, approximately $600 million has been invested in the project since it opened 5 years ago, and its currently on the books for $401 million as of June 30th. While Lumiere is probably worth far less than $600 million today, Tropicana clearly purchased it for less than replacement cost. Pinnacle has previously disclosed an annualized EBITDA of $34 million for Lumiere, at a $260 million purchase price, the EV/EBITDA multiple is 7.5x, just below what the average casino operator is trading today of 8-9x. 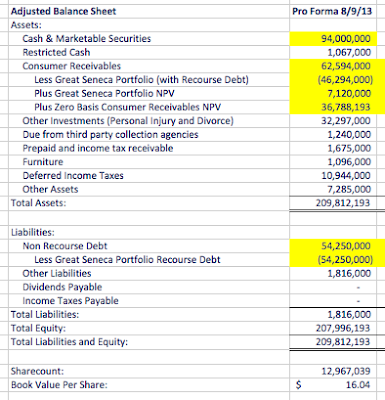 As of 6/30, Tropicana had $241 million in cash and $170 million in debt, for a net cash position of $71 million. The $13 million in interest payments on the term loan facility versus the minimal interest income from the cash has been a drag on earnings. Tropicana has the option to increase their term loan by $75 million and has an used $15 million letter of credit facility giving it plenty of room to make the Lumiere purchase, but not a lot more given their annual capital expenditure needs (which currently roughly match cash flow from operations). This purchase seems about the perfect size given Tropicana's balance sheet, meaningful but not a stretch. While I continue to think that the EV/EBITDA ratio is best for the gambling industry due to the varying capital structures, the purchase of Lumiere Place should also make Tropicana look cheaper on a more traditional P/E basis as the idle cash and term loan (which have a drag on earnings versus being cancelled out looking at it from an EV/EBITDA basis) will be invested in a productive income generating asset. Icahn Enterprises currently values (for the purposes of their non-GAAP NAV) their 68% pre-Lumiere stake at $566 million, or 9x EBITDA. Using that same 9x EBITDA valuation for the post-Lumiere Tropicana, and the equity should be valued at $873 million versus a market cap of $405 million today, so the market is giving you almost a 55% discount to become a minority shareholder in a company controlled by one of this era's top investors, seems like a good deal to me. 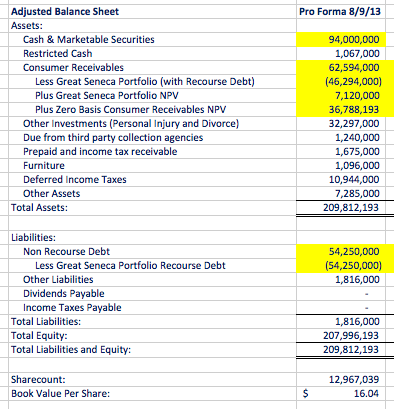 It's been years since Asta Funding has been actively buying distressed consumer debt portfolios, their core business, and while they returned to that market this past quarter with a $3.3 million purchase of $53 million in face value of receivables, I think the much more important transaction is the renegotiation of the Great Seneca portfolio debt with BMO. In the past I have treated the Great Seneca portfolio as a free option, and assumed it was worthless and the non-recourse debt would be written off as well. "On August 7, 2013, in consideration for a $15 million prepayment funded by the Company, BMO has agreed to reduce minimum monthly collection requirements and the interest rate significantly. After BMO receives the next $15 million of net collections from the Great Seneca portfolio, offset by credits of approximately $3 million for payments made to BMO prior to the consummation of the agreement, the Company is entitled to recover, out of future net collections from the Great Seneca portfolio, the $15 million prepayment that it funded. In exchange for possible future debt forgiveness, BMO has the right to receive 30% of future net collections, after the Company has recovered its $15 million prepayment"
Although the 6/30/13 financials show $105 million in cash and securities, Asta paid BMO $15 million this past week as part of the revised agreement and now has $94 million in cash/securities (presumably after $4 million in cash inflows). In essence Asta is reinvesting in this portfolio, while it might not be counted as a new portfolio purchase, its almost the same thing. Going forward the first $12 million (net of $3 million in previous payments) will go to BMO, following that Asta will get the next $15 million and recover the prepayment, then the remaining revenue will go 70/30 to Asta/BMO. So given the Great Seneca's net realizable value is $46.3 million, the first $27 million is allocated to BMO first, then Asta, leaving the remaining $19.3 million to be split 70/30, or $13.5 million to Asta Funding. Asta's accounting is generally conservative (still making $9.75MM this quarter in zero basis assets), I think the $13.5 million number is likely an appropriate value for the end recovery value of the Great Seneca portfolio and may end up being a bit low. Asta currently receives about $3 million a quarter on the Great Seneca portfolio, if this continues, BMO will be paid off in one year, and Asta will recover its $15 million prepayment in about 9 quarters. If the $3 million quarters continue from there its about another 8 quarters (or 4 years from now) before the net realized value would be recovered in the 2nd quarter of 2017. While it might initially feel generous to assume the $3 million can continue that far into the future, I've been pleasantly surprised the zero basis portfolios have continued to produce consistent cash flow for the past several years, and show little evidence of slowing down. So assuming a $3 million a quarter run rate, Asta would earn about a 33% IRR on it's initial $15 million investment over the next 4 years, or an NPV of just over $7.1 million using a 20% discount rate. The prepayment will make the balance sheet look a little weaker in the next few quarters, but I would say this is clearly a smart transaction for Asta. Based on how I've previously valued Asta Funding, removing out the Great Seneca portfolio and adding in the NPV of the zero basis portfolio, I've made another attempt and included a line for the NPV of Great Seneca given the new arrangement. As you can see, I roughly value Asta's book value at $16 per share, or 77% higher than it's current price of just over $9. All the minority shareholders would probably prefer a big stock repurchase plan (which has expired and has not been renewed), but it appears Asta is finally using their excess cash and investing again in the core business which should be a net positive. Below is a brief round up of a few names I've mentioned on the blog before and their recent results. AIG had another nice quarter, exceeding expectations and announcing the initiation of a $0.10 dividend and another $1B in share repurchases. These moves were surprising given the drama surrounding the ILFC sale to a consortium of Chinese buyers, which has seen several deadlines come and go. They're still working with the consortium to see if a sale can be completed, the deadline has been pushed back to the end of August, but AIG is also preparing for an IPO of ILFC later in the year that would de-consolidate ILFC (meaning they'd sell at least 51%) from AIG's financial statements. AIG's book value is now $61.25, and its recently trading for just under $49, so the discount to book value has been closing fairly quickly. While I still view AIG as a long term hold, I would consider selling for around 95% of book value which is still a little while off. In the meantime hopefully book keeps growing with retained earnings and gets accelerated with AIG repurchasing shares at below book. Calamos Asset Management's (CAM, but CLMS is the ticker) market value hasn't moved much since I initially profiled the company a few months ago, but the assets under management have taken a 10% slide to $27.4 billion as of 7/31. As a result, pre-tax earnings are down over 30% from last year's run rate, proving the operating leverage in the asset management business works both ways. Their flagship Calamos Growth and Calamos Growth & Income funds are suffering large outflows due to poor recent performance; the Calamos Growth Fund is in the bottom 92% of its peer group over the last five years, according to Morningstar, making it a dreaded one-star fund. What financial advisor wants to answer the "why am I in a one-star fund" question from a client? Calamos has been countering their growth fund strategy issues by introducing several new value and alternative strategy funds to diversify their revenue business model. The alternatives segment is the one strategy where Calamos is seeing net inflows, and I think that it has the most potential as its not a strategy that's easily replaced by an index or passive fund. Financial advisors are moving assets to index and passive mutual funds, traditional managed A share type funds are at best out of favor and might be in a permanent secular decline. Alternative mutual funds are an easy sell after the past decade of volatility and given their complexity, one where the management fee is a more justifiable, maybe. The value in Calamos is still primarily in the odd corporate structure that causes the operating company to be consolidated with CAM, but where CAM only owns 22.1% of the operating company. This consolidation hides the assets that are attributable just to CAM, which are worth roughly half the market capitalization. Based on the same assumptions as my original valuation, I put the CAM's current value at roughly $16.39 per share today. The Calamos family has the right to exchange their ownership for CAM shares based on a fair value approach. The above is the quarterly reconciliation that Calamos publishes based on the accounting quirk that's the primary reason its undervalued, but it could also be used as the reason for the Calamos family to dilute the CAM shareholders out of that value under the guise of a fair value exchange. The shares issued line under the no recognition of other assets assumption is almost twice the shares in the full recognition assumption. That's been hard for me to get comfortable with, so despite the CAM shares being materially undervalued, it's remained on my watch list. My natural gas pick, Ultra Petroleum, had another good/boring quarter as they continue to keep capital expenditures within cash flow and just tread water until natural gas prices fully recover to a more normalized level. "So a quick reminder of how we view our assets. At $4 gas, we restore all the value and volume to our proved reserves. That puts us at 5 trillion cubic feet of proved reserves and PV-10 value of $5.25 billion, which is approximately our enterprise value today. Looking forward a bit to $4.50 gas and ignoring the 5-year limit on PUDs, Ultra would have 9.2 trillion cubic feet equivalents of proven light reserves, with a PV-10 value of $8.1 billion. This translates into a $20 per share increase in stock price." $4.50 gas might be farther away than it sounds as prices have moved back down to under $3.50 in the past few weeks. On my favorite slide in their presentations, Ultra doesn't forecast $4.50 prices until 2016, but its a comment that I wanted to keep highlighted for future reference. The other management comment I liked was the possibility of a share buyback or dividend in the future with their free cash flow, versus all the talk of an acquisition last quarter. Given the high returns of their Pinedale asset, I don't see why they'd be looking to dilute those returns unless it was an acquisition for acquisition's sake. I picked up some shares in the $16-17 range earlier in the year, and recently sold an equal amount of higher cost basis shares to reduce my position size to a just above average weighting. I wanted to take some risk off the table and with Ultra's share price increasing with natural gas prices decreasing, seemed like a good opportunity. Gramercy's quarter again looked mostly as expected, and as management stressed on the call there's a noticeable lag in what the financials look like and the future state of the business. Gramercy made significant progress towards investing their available cash in net leased assets, completing 11 discrete transactions for $111.2 million (mostly towards the end of the quarter). During the question and answer session of the conference call, management indicated that this level of activity would be a good base case run rate for Gramercy through the end of the year. I found this comment particularly interesting based on their capacity analysis slide below showing $96.9 million in remaining capacity. So this leads me to believe that most of Gramercy's available cash and borrowing capacity will be exhausted by the end of the 3rd quarter or early 4th quarter, setting up for the dividend to be caught up on the preferred by year end as that would likely need to occur before any major capital raise. As for the what the common is worth, I'm going to take a slightly different approach than my previous quarterly recaps (here and here) and instead take a balance sheet look at the valuation based on a slide that Gramercy provided in their presentation. The one thing I noticed initially, is the plug "Intangibles" line item on the asset side is negative, meaning the market is valuing Gramercy above its current NAV. Given Gramercy's acquisition pace and their capacity analysis slide, I made a few adjustments below to back into a new NAV based on full cash/capacity utilization before a capital raise. I took the $96.9 million in net equity capacity and assumed Gramercy would make new acquisitions at a 9% cap rate (average of the 2nd quarter), and then those assets would be revalued by the market at a 7% cap rate ("widest arbitrage in our experience") to come up with $124.59 million in additional real estate owned (on top of the $10.6 million in the pipeline). Making those asset purchases zeroes out both the cash and CDO advances and asset sales line items, but keeps the KBS Promote and CDO Bonds line items. 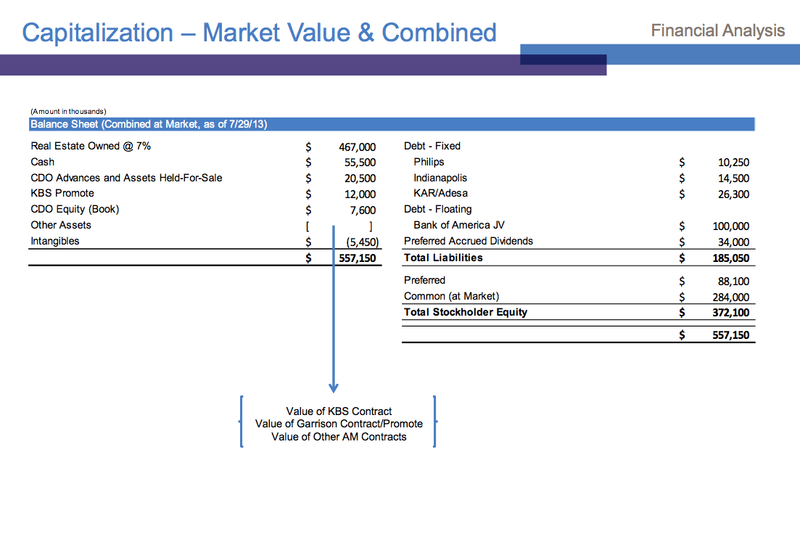 In Gramercy's slide they leave out the value of the asset management contracts, but these clearly have value. Given that they're generating $4 million in after tax contribution annually, and have about a 3 year lifecycle, I discounted that back a bit to a round $10 million to come up with a total asset value of $631.8 million. 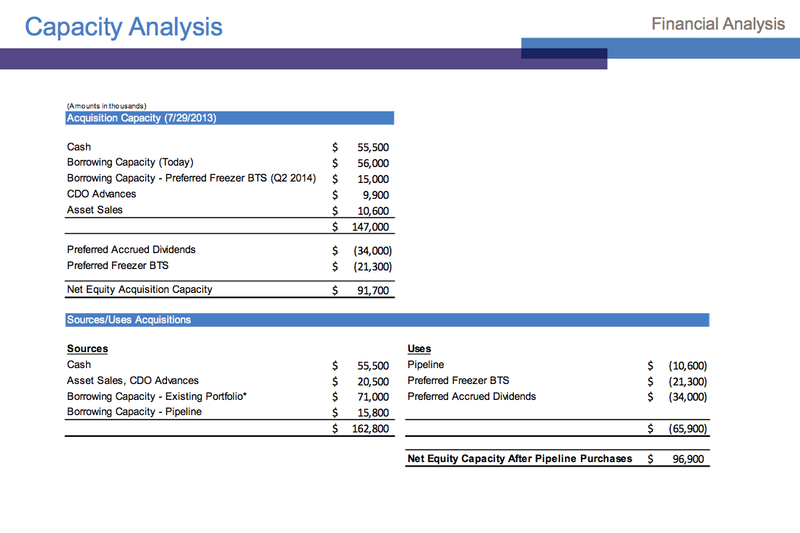 On the liabilities side, I removed the preferred dividend as its paid in the capacity analysis calculation and then added the pipeline and current portfolio borrowing capacity numbers given in Gramercy's guidance, making the total debt $237.9 million, or roughly 40% of the real estate value, inline with management's comments today. Removing the preferred par value, and the common is worth $305.8 million, or $5.14 per share, which is pretty much the same as I've come up with before, and is only ~15% above what it's trading at now. But I think the dividend is finally on the horizon, and then Gramercy can start raising capital and further exploiting the private/public net lease arbitrage. Gramercy remains my largest position, although I might be tempted to sell a bit if it trades above $5.20 again without paying the dividend.